The above picture shows the first photo of the famous Milky Seas Effect. It's a luminescence that turns thousand-mile patches of ocean a glowing milky blue. Bioluminescent algae are not new to science. It's not unusual for them to light up the ocean, especially when they're agitated by crashing waves. Sometimes entire boats can be tracked by the glowing wake they leave. But occasionally, entire swaths of ocean can be lit up. Reports came back from ancient sailors that they sometimes crossed thousands of miles of water that were so entirely lit up that the sea everywhere around them. By night it the light glowed blue; by day, when it competed with the sunlight, the sea looked more like thin milk. It was 1915 before reliable sources documented the effect, but even as the world got more modern and the sea was traversed by aircraft carriers and commercial flights, it was hard to find a picture that could prove the scale of the effect. 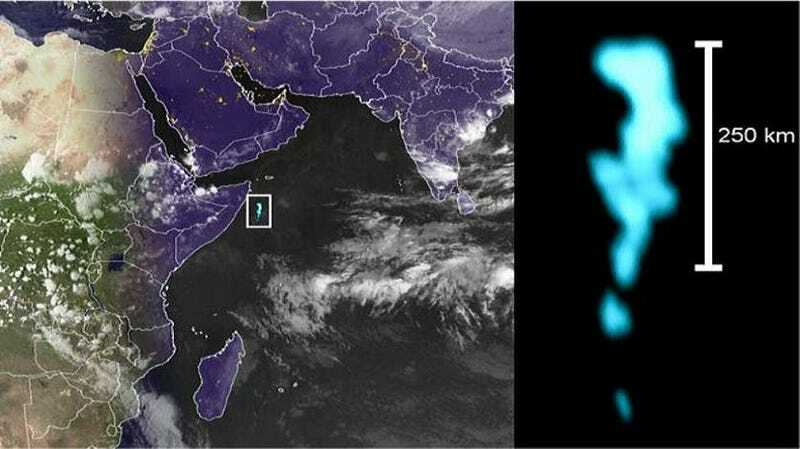 In 1995, someone finally managed it — the US Defense Meteorological Satellite Program got a picture of a 250 kilometer long patch of glowing stretch of ocean off the coast of Somalia. It's an amazing sight, even from space.